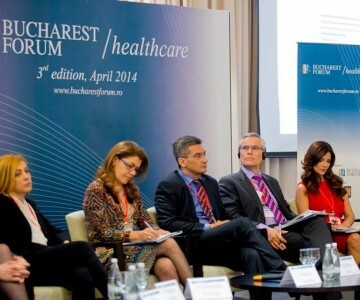 The Bucharest Forum / Healthcare symposium will take place in Bucharest, on April 4th, 2014. The event is the third healthcare sector specific conversation in the framework of Bucharest Forum, which is a part of the larger family of global debate platforms linked to the New York Forum. The Aspen Institute Romania and Link Resource, under the auspices of the Romanian Government and with special support of Romanian Ministry of Healthcare, National Health Insurance House and National Agency for Medicines and Medical Devices, are developing a long term dialogue platform designed for decision-makers in the healthcare sector. Focusing on public policies and best practices in healthcare the series (comprised of public and closed door meetings), the event is part of the Aspen Institute Romania’s Healthcare Reform and Quality of Life Program. Building on a body of European and American expertise in areas encompassing medical technologies and R&D, health technology assessment, public and private healthcare financing, zoning and prioritizing, but also communication, the organizers aim for lively, non-partisan and inclusive debates with a view of supporting, streamlining and assisting efficient policy making in the field. This is built to serve both public sector and private sector decision makers and administrators. Based on the outcomes of its previous editions, the organizers would like to further progress in finding sustainable solutions to the perennial and evolving problems of healthcare systems by bringing together key stakeholders and their views on available alternatives. The event on April 4th will gather healthcare sector specialists, national and European regulatory experts, medical technology and pharmaceutical sector researchers and decision makers, as well as healthcare sector business leaders, with significant role in shaping healthcare policies. The organizers of this event will gather the best solutions brought up during the debate and promote them through the Romanian and international media channels and via the membership networks of the Aspen HC Program. The most salient topics will be debated at national scale influencing and shaping decision. As such, the event serves both as a distiller of ideas and a reference in terms of testing new options and solutions. 09:30 – 11:30 Health Economics and Market Access Strategies – Translating New EU Trends into the Eastern Europe Context. Is Romania Ready for MEA’s (managed entry agreements)? In a nutshell, the 2014-20 Healthcare Strategy published by Romanian healthcare authorities puts forward a complete transformation of the healthcare system, shifting its paradigms and re-drafting operational principles. Where pharmaceutical industry is concerned, the document re-states the intention of the Ministry of Health to increase efficiency of spending by reviewing the reimbursed medication on HTA basis. Meantime, at EU level, the dialogue between the industry and the healthcare systems is focused on transforming the challenges of today’s austerity into the win-win health partnerships of tomorrow by making use of newest market entry tools available and modulating their implementation according to the characteristics of the market, while also keeping an eye on the harmonization of these pathways and sharing best practice across the Member States. • How ready is Romania to face EU regulatory developments in this area while fostering an attractive business environment and observing the macroeconomic constraints? • Which are the latest MEA and risk sharing developments and how do these reflect on future prospects and policy options? Luca Visini, Senior Advisor ACE Strategic Projects, Eli Lilly Romania S.r.l. The deep transformation of the healthcare system envisaged by the Romanian authorities (and detailed in the Strategy published at the end of 2013) also touches on the role and relevance of clinical research activities. Medical research has been for too long a topic confined to professional communities. Yet, successful examples in other EU Member States, such as the UK and Belgium, show that by creating a seamless interface between medical research activities & regulators, companies and authorities, an entire new assistance infrastructure is created and offered as a viable option for the patients (who thus have access to cutting-edge medical solutions to the health issues they experience). Additionally, such an infrastructure fosters a steep learning curve for the professional community and contributes to relieving the economic burden, thus providing benefits for the entire healthcare system. Meanwhile, in addition to data provide by the clinical trials, the use of real-life data and their relevance for the reimbursement-related decision-making is increasingly at the focus of attention the competent authorities across EU which rely on such type of information in (re)assessment of health technologies. A similar approach that includes a review of medicines benefits after a certain period of being reimbursed is suggested by the draft reimbursement list recently published by the Romanian Ministry of Health, thus seemingly aligning local processes to the EU best practices. We hereby invite you to a dedicated debate, focused on possible strategies for disseminating information on clinical research while also examining the usefulness of such information for institutional decision makers and the manner in which real-life data may be used for further refining healthcare policy choices.